Part of a larger game plan to ‘mainstream’ Aligarh Muslim University, say students; former VC Hamid Ansari calls it stupid antics of local politicians. New Delhi: Students and the administration of Aligarh Muslim University sniff an “insidious” RSS agenda behind the spate of controversies, including the latest one surrounding a Jinnah portrait, on its campus. The latest row, they say, is part of a larger game plan to “mainstream” the minority institution. Former Vice-President Hamid Ansari, who was at AMU Wednesday to deliver a lecture, dismissed the row as “puerile and stupid antics of a few local politicians and activists”. The controversy is a result of the “base motivations” of a few, and not worthy of a comment, Ansari, who is also a former vice-chancellor of the university, said. However, for students and administration of the university, the matter cannot be overlooked as just another antic of Right-wing groups, desperate to leave their stamp on the country’s India’s oldest Muslim university. 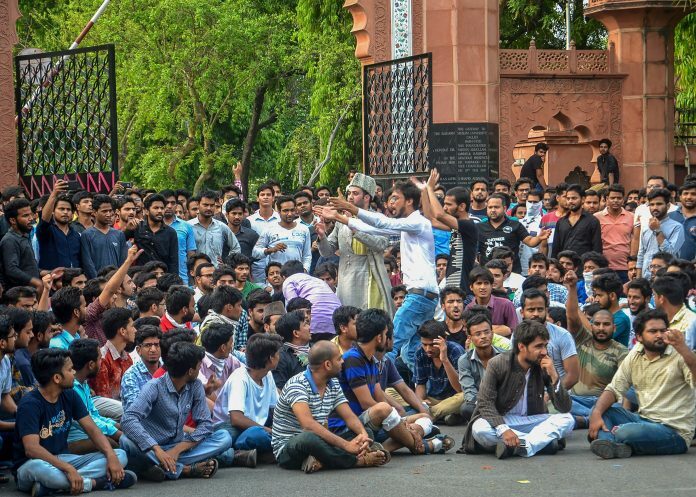 While Jinnah’s portrait may have become the most recent flashpoint of the confrontation between the AMU and Right-wing groups in Aligarh, attempts to “mainstream” AMU have been underway for a while now, students claim. “They have always seen AMU with suspicion,” said Sajad Rathar, vice-president of the students’ union. BJP leader Subramanian Swamy’s statements about the university corroborate the students’ assertions. Last month, Swamy called the university “a hub of terrorists and extremist ideologies”. While students of the university were still reacting to what they called Swamy’s “divisive mindset”, an RSS activist in Aligarh, Amir Rasheed, wrote to the vice-chancellor requesting him to open a shakha on campus. Swamy and Rasheed then met in the capital to discuss the issue in greater detail. “Obviously AMU is important enough for ministers in Delhi to get involved in,” Rathar said. He, like many others believe that AMU will have to “fight back” against the administration like JNU has had to for the past two years. While the administration is not as critical, it too expressed astonishment over the sudden outrage. “Why just AMU,” asked Shafey Qidwai, spokesperson of the university. There are multiple places across the country, including the Nehru Museum and the Indian Institute of Advanced Study in Shimla, where Jinnah’s portrait is hanged, he said. “We stand totally opposed to Jinnah, but he was accorded the lifetime membership of the AMU students’ union in 1938, and his portrait is only hanged in the university in that capacity,” he said. While the university is yet to take a call on whether to remove the portrait, Uttar Pradesh chief minister Yogi Adityanath jumped into the fray Thursday, saying India cannot honour Jinnah. “Jinnah divided this country. How can we celebrate his achievements,” he said. “I have asked for an inquiry [into the clash in AMU]. We will act as soon as the report is submitted,” Adityanath said in an interview. For students in the university, who have no sympathy with the founding father of Pakistan, the recent brawl is only a manifestation of the RSS’ unrelenting attempts to “conquer” their university. “There is a riot-like situation on campus…The police lathi-charged students of AMU who just wanted action to be taken against those who barged into our campus with the intention to polarise and divide,” said Rathar. “Do they think we can’t see why they are doing this so close to elections? AMU is not just a university for the Sangh, they treat it as their political battleground,” he said. Rathar has an unusual ally in Vikrant Johri, an RSS follower, who had fought the students’ union election against the former last year. “We agree with Satish Gautam (the BJP MP who wrote the letter to the vice-chancellor which sparked off the controversy). But why now when the discourse in the country is anyway so unfavourable to AMU?” Johri asked. “We do not support what is happening, and the students of AMU are together in this,” he added. First Modi, Amit Shah , & BJp now Bollywood next will be south flim industry ….. after 2019 u will be jobless ohhh but need not to worry becoz u have money …. enjoy …..